Mixed martial arts legend Vitor Belfort has been out of the fighting game for about two months now. “The Phenom” announced the end of his UFC career after suffering a knockout loss to fellow Brazil native Lyoto Machida back at UFC 224 on Rio de Janeiro. That being said, Belfort recently met with UFC President Dana White in the famous match making room. Featured in the background, White and Belfort could be seen in front of a massive whiteboard. On the whiteboard, a series of match ups were displayed. 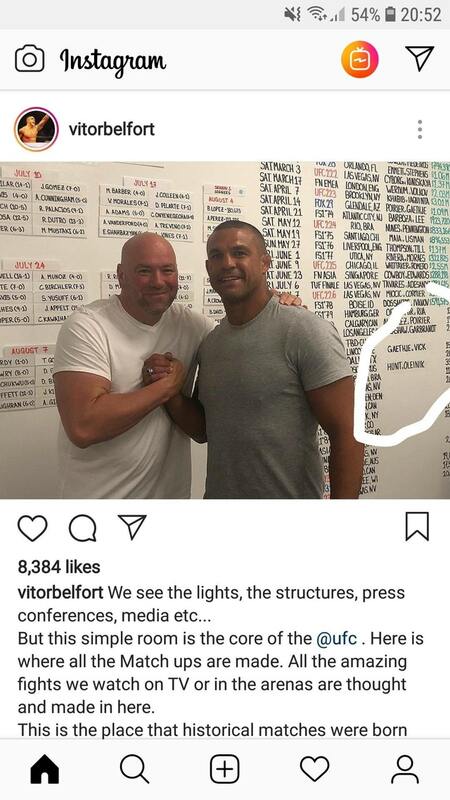 As circled within the photo below, a yet unannounced heavyweight match up between Mark Hunt and Aleksei Oleinik can be seen. Vitor Belfort has since deleted the social media post, as many fight fans began pointing out the supposed match up from the board. Check out a screen cap of the social media post down below. The fight has yet to be officially announced, but it would appear that the Ultimate Fighting Championship (UFC) is targeting Mark Hunt’s next octagon performance.